THE STORY - Once a nation crippled by military dictatorship, Brazil found its democratic footing in 1985 and then, in 2002, elected a hugely popular political disrupter: steel-worker-turned-activist Luiz Inácio Lula da Silva. Under his watch, 20 million Brazilians were lifted out of poverty, and his country rose to international prominence. In 2010, “Lula” passed the presidential baton to his prodigy, a fierce female guerrilla named Dilma Rousseff.But beneath their sunny legacy, rumblings of populist rage and institutional corruption seeped into the mainstream—much of it abetted by a partisan judge who fed news outlets sensational, deeply flawed corruption reports that targeted Lula, Dilma, and anyone else who refused to scratch the backs of powerful politicians and special-interest groups. 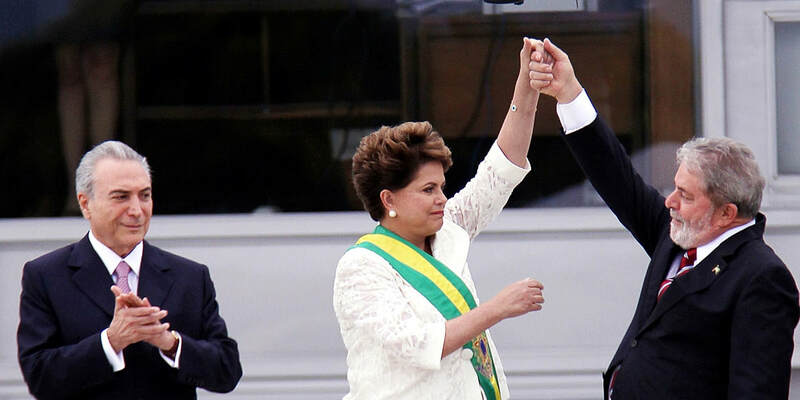 “The Edge of Democracy” gets, as Hamilton would say, “In the Room Where It Happens” of Brazilian politics to capture a singular moment on Brazilian politics, leading to a legal coup and the subsequent rise of a would-be dictator. Gaining unparalleled access to the political players involved, Director Petra Costa captures Brazil’s crumbling democracy in real time. Costa's interviews and first-hand footage are frankly astonishing in their unflinching depiction of corruption, greed, and misogyny. She lands a wealth of interviews with almost every politician of note throughout five years of political turmoil (including all three recent Brazilian presidents). In the process, we hear political figures agree to accept bribes, call for assassinations, and admit to impeaching a woman political because she’s “not likable.” The corruption is so bald-faced, and Costa captures it all. But the piece is more than a mere slice of front row reporting. Costa (who also narrates the film) stages the piece as a meditation on politics, national identity, sexism, family legacy, racism...essentially, she states an epic in documentary form, attempting to encompass her thoughts on the perceived downfall of her and her family’s own young democracy. The documentary is as much about the legacy of herself and her own family, a family that boasts both liberal reformers and the old money elites who propagate the corruption eating away the country as it is about the politics of others. In a sense, this is the closest you can come to an epic in documentary form. As such, the film is admittedly messy at times. There is just so much to tackle that the film feels ready to burst at the seams. In addition, some of the camera work is sloppy (likely by necessity due to the requirements of capturing tragedy as it unfolds, but it is distracting nonetheless.) In addition, for those unfamiliar with Brazilian politics, the ongoing political machinations can be occasionally difficult to follow. However, there's a universality to the political graft and corruption on display, and in turn to all of the themes on display. As Brazil veers further and further to the right, the political parallels to America are undeniable. At one point, a supporter of Brazil’s newest far-right President even wears a Trump mask. And perhaps that’s an added element of what makes the film so fascinating. It’s not merely a story of Brazil’s downfall. It’s a cautionary tale for all democracies. Ultimately, as riveting as it is horrifying, "The Edge of Democracy" is one of the must-see documentaries of Sundance and deserves to be seen when it eventually hits Netflix in 2019. Even if the documentary occasionally bites off more than it can chew and features an often unpolished aesthetic, the film plays like the very best political fiction. Its importance cannot be overstated and ensures the viewer will mourn for the future of Brazil and hopefully strive even more to protect democracy in their own countries.